MOLLUSCA : NUDIBRANCHIA : Rostangidae SNAILS, SLUGS, ETC. 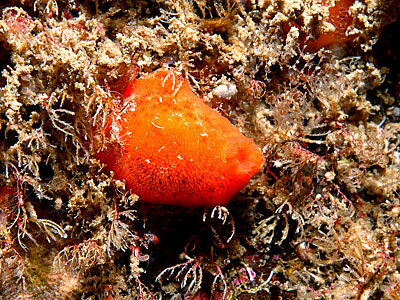 Description: The colour of this nudibranch varies from bright red to pale orange-yellow with tiny black spots scattered on its dorsum. The mantle bears many minute tubercles and defensive spicules. There is a characteristic pale patch between the rhinophores. Adults may attain a body length of up to 15mm. 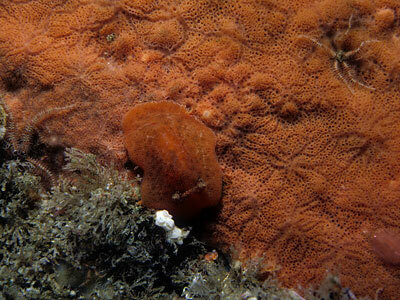 Habitat: Feeds upon the red sponges Ophlitaspongia seriata and Microciona atrasanguinea. It is most often found on the low shore or in the shallow subtidal. At St. Kilda it feeds on Ophlitaspongia kildensis in the sublittoral. Distribution: R. rubra has been found around the Orkneys and at St. Abbs Head on the North Sea coast as well as on the south and west coasts of the British Isles. Further distribution from Norway south to the Mediterranean. 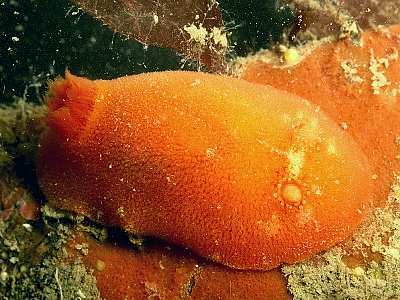 Similar Species: Unlikely to be confused with other British dorids except perhaps with the red variety of Archidoris pseudoargus. 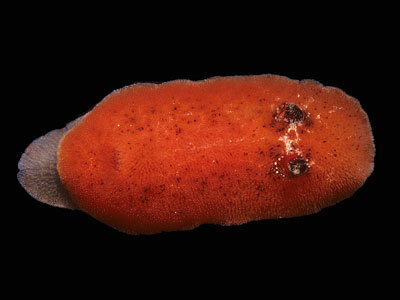 Red dorid with paler patch between rhinophores. Gills small, held in a neat vertical cup. Picton, B.E. & Morrow, C.C. (2016). Rostanga rubra (Risso, 1818). [In] Encyclopedia of Marine Life of Britain and Ireland.